Hello and welcome to the 197th instalment of the SWD. The Syrian Democratic Forces have retreated from some parts of Mansour street after a powerful ISIS-led attack. Clashes took place in the Rawdah neighbourhood and the old city, too. The MFS and YPG have been very active in the Nahdah district, Al Moroor neighbourhood, and Al Tas’hih district as SDF forces tried to capture these areas from ISIS. The Commander of the Manbaj military council “Adnan Abu Amjad” was killed during clashes against ISIS in Raqqa city. Clashes between SAA and ISIS continue on the southern bank of the Euphrates river in Raqqa governorate. The situation there remains unclear as information is widely biased, inaccurate and scare. Late reports suggest that ISIS has retaken all the land located on the southern bank of the Euphrates from Ma’adan to Subkhah, including Ghanim Al-Ali. 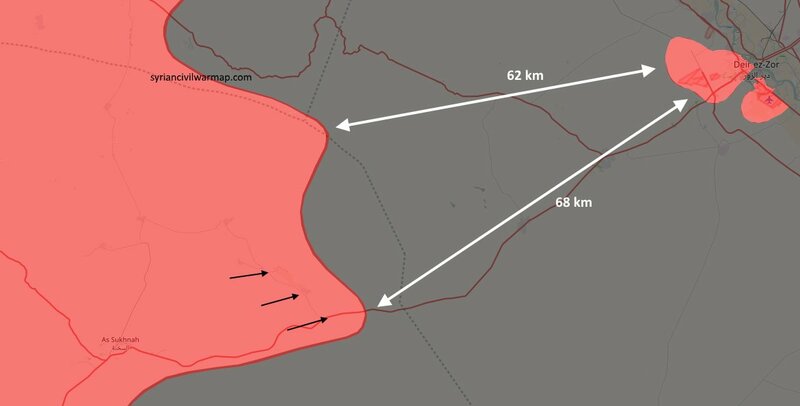 Even though, heavy strikes by the Syrian and Russian Air Forces targeted multiple villages in East Raqqa. Furthermore, some sources report that at least 64 soldiers have died, multiple vehicles captured, including a T-55 tank, and also multiple munitions have been captured, too. The buses carrying the ISIS militants’ families arrived at the al-Hamimah checkpoints. These buses are a SAA-led evacuation of ISIS militants and its families from Qalamun area to Deir ez-Zor in exchange of the ISIS-held territory in west Qalamun mountains in the Syrian-Lebanese border. Turkish-backed opposition and US troops exchanged fire in northern towns close to Manbij. No casualties have been reported, but the International Coalition already had issued a formal protest to Ankara. Free Syrian Army officials denied the Coalition claims about clashes. Russian military observers were spotted in different areas of the SDF-held Afrin area. Russian patrols were deployed on a mission to carry out surveillance and protection missions all around Afrin and Al-Shahba regions. Despite the Russian presence, the Turkish-backed forces continued shelling Afrin city centre from Azaz. Four mortar shells injured at least seven people. YPG units fired some shells to the cities of Azaz and Mare as a retaliation of FSA previous attack. Syrian government forces bombarded Hayan town with heavy artillery, at least one person died. Moreover, the Syrian Arab Army also shelled the opposition-held areas in south Aleppo. The SAA attacked some of these areas. The FSA group “Free Idlib” made a statement demanding all the military groups to non-interfere in the council’s affairs. Government forces bombarded Tamanaa town. The satellite image shows that Russian S-400 air defence missiles have been placed next to the Iranian missile factory that is being built in Syria. Government war planes have carried out air strikes against the opposition-held cities in north Hama area. Strikes targeted Kadr Zeita town and Al Lataminah city. On the ISIS-held pocket, the SAA and allies took control of the town of Taybeh and a number of ruling points overlooking Abu Hakfa and the east of Tal al-Alawi in eastern Hama countryside. Additionally, SAA forces captured Taybah, Haddaj, Rasm Zaynab, Tahmaz, Bir Ghazalah, Kherbet ‘Amarah, Wadi Khullah and Jawasiyat Janubi. North Homs Operation Room raided some government checkpoints near Teldara in which they killed at least nine SAA soldiers. The SAA group “ISIS Hunters” captured Al-Mushayrifah area, which is 2 km far from Uqayribat, the last ISIS stronghold in the ISIS-held Homs-Hama pocket. SAA and allies continue to push back ISIS militants in Homs desert to Deir ez-Zor governorate. Today, SAA killed dozens of ISIS militants and destroyed an unknown number of vehicles in the villages situated east of As-Sukhnah city. The Syrian Arab Army captured Jabal Dahik and Al-Sharqi, which locates government forces 70 km away from Deir ez-Zor city. Thus, government forces have officially entered Deir ez-Zor pocket from Homs side. The 4th division of the Republican Guard renewed the attacks on Jobar and Ayn Terma fronts with armours. Some soldiers were killed by Faylaq Rahman group. The FSA groups “Al-Abdo Martyrs” and “the Army of Eastern Lions” destroyed FWD vehicles and ammo vehicles; and targeted artillery positions in Tal Wateed. 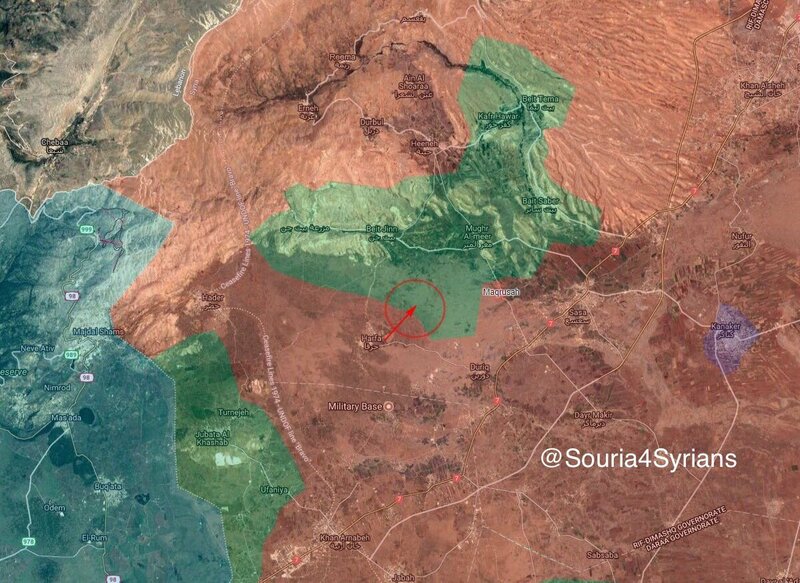 SAA captured Wa’rat Qalla’ Room which gave the SAA fire-control over Beit Jinn-Maghr Meer road after launching a surprise offensive on Harfa-Maqrusah axis in south Damascus governorate. Three killed and others injured after an IED exploded in Zimrin-Simlin road in western Daraa. Operations to retake the ISIS-held Daraa pocket continue by FSA units. Today, opposition forces thwarted an attempt by ISIS to infiltrate FSA positions. Jaish Thawra, an FSA group, targeted the ISIS affiliate Jais Khalid’s positions in Jalin. On the 29th of August 2017, CJTF-OIR has conducted 51 strikes in Syria. CJTF-OIR‘s main focus in Syria is Raqqa region where they did 46 strikes supporting SDF‘s operations against IS destroying 66 fighting positions, five heavy machine guns, five vehicles, three medium machine guns, three anti-air systems, two commands and control nodes, an ISIS headquarters, a weapons cache, a staging area, and a VBIED; damaged eight fighting positions; and suppressed two heavy machine guns. Other areas where five strikes occurred are Abu Kamal and Al Hawl destroying six ISIS oil stills, five oil storage barrels, a front-end loader, a fuel truck, and an ISIS command and control node. The full report on CJTF-OIR strikes conducted in both Syria & Iraq can be found here.